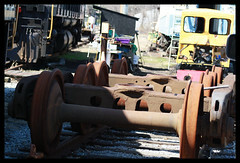 Great day out in the West Chester, Pa railyard. managed to take some personal shots. They granted us unrestricted access to shoot in the Rail yards. I'm waiting for my client to update his MySpace, and other social networking accounts, so I can start uploading pics from that day's shoot, and link over to his page(s) so others know how to contact him for hire.